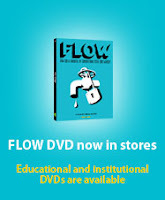 This is a film synopsis for the excellent film Flow: For the Love of Water, featuring Canada's own Maude Barlow. I saw her speak once, and she was very inspiring. Don't miss her if she comes near your city. But she's pretty busy now as the first ever UN water advisor. The film runs 93 minutes. It's fast enough to keep kids entertained, and it's very informative and edited well. It mixes enough depressing stories with stories of hope to make it motivating overall. It has sub-titles at times, so it's only for classes who can/will read as they watch. I use the film in my Challenge and Change in Society class but it suits a World Issues class equally well. The following are points I collected as I watched. There's no direct questions for the students here, and I apologize for the point-form-ness of the writing. If you're interested in the topic, I encourage you to read Blue Gold, or watch the film which I haven't seen yet. Let me know if it's useful! 2 million die from dirty water each year – mostly children. Water kills more people than war. There's no active records of illnesses – between half and 7 million people. 40% of flues are really due to viruses in tap water. Treatment plants don’t remove industrial chemicals – most exposure is during showering. Chemicals are changing our body chemistry. Adding pesticides to crops increases water needs in order to dissolve chemicals – 5-10 times the water usage in the past 30 years. Water use: 70% agricultural, 20% industry, 10% public. They've also got and increase in birth defects and cancer, decrease fertility. Atrazine is the most common herbicide in US, made in Switzerland but banned throughout Europe. It's an endocrine disruptor. Bush won’t stop using the chemical. Waste from a slaughter house and raw sewage is dumped in the lakes. Three companies own water: Thames, Vivendi, and Suez, and then there’s Pepsi, Coke, and Nestle. The object is to privatize all water which causes people to be excluded from services. Political leaders are bought off or convinced that jobs and prosperity will come. In 1999 the government privatized Bolivian water. It was forced to by the World Bank or else it would be cut off from any water development. In 2002 the government ended Suez company deal and gave water back to citizens. They need tablets to clean water, but can't afford them. They must pay for services. IMF under Director Camdesses are in control. Citizens need the know-how of the private sector. Private sector welcomed thinking it will bring money – but it just takes water and leaves nothing for citizens. Now they pre-pay for water. People are being evicted, then re-connecting illegally to have water. If water is centralized and piped in, it’s unaffordable to them. We’ve know about pathogens since the 1920s, and we have an affordable way to clean water through Ultraviolet Filtration – only costs $2/person/year. Companies want to privatize water to make it more efficient; want an open market for sale. Water is a $400 billion global industry second only to oil and electricity. Maude Barlow: the market is amoral as it takes advantage of scarcity. 1 person regulates the entire industry and does other jobs as well. The FDA has no idea what’s in bottled water. 20% of the US won’t drink tap water. 30% of bottle water samples have arsenic, chemicals and bacteria. The World Water Council (WWC) promotes corporate takeover of water. The World Bank and the IMF are becoming the world government, and they haven’t been properly elected. Commodification is about power – whoever owns the water, owns the world. Used to store water, but alter the ecosystems. Organic matter is trapped, makes methane, creates 20 times the greenhouse gases as a coal plant. It benefits only large farmers. 40-80 million people worldwide have been displaced because of dams being built. Temples, monuments... are all under water. The World Bank likes dams because they’re expensive and create jobs and look good. They prefer to spend $1 billion in one place instead of $1,000 in lots of places like for cisterns in people’s homes. Owns 70 brands of water. In Michigan they're pumping at 450 gallons/minute – drying up the river beds and causing significant adverse impact. Citizens sued after much protest. Nestle hired a P.I. to harass citizens who signed the petition. Nestle lost the first round, but won on appeals. Now they have a right to pump where ever they want in the US, but at a slightly slower rate. Nestle leases the property from the city to do the pumping, so the city sees some money, but not much. By 2020, half the world won’t have water. Even in the Roman Empire water was seen as a public right that can’t be privately owned or sold for profit. If diversion of water affects people it should be considered unlawful. Legally, in the U.S., it’s considered unconstitutional to stop water pumping unless you personally own property that’s being affected. Will give money for water only if the public stand posts are closed down thus depriving most people from water to benefit the wealthier groups. There is no technology to match a foot march. People must take to the streets worldwide to speak for one common humanity, one common survival. We need to work in harmony with water. We can only live if we make friends with nature. Sign the petition to the UN to include access to water as a right. The proposed Article 31 states: Everone has the right to clean and accessible water, adequate for the health and well-being of the individual and family, and no one shall be depreived of such access or quality of water due to individual economic circumstances.